The terrifying memory of 9/11 sits like a chicken bone in the throats of confused Americans. It is an untreated injury whose growing infection is rapidly proving fatal to the self-determination of our deteriorating species and the decaying condition of our dying planet. We are strangling on the lies our leaders have forced us to believe. You can’t expect to solve anything or detox any public lie as long as the 9/11 mystery remains unsolved. The question of questions that remains is why do all these public shootings, from San Bernardino to Boston, seem to happen simultaneously with scheduled anti-terror drills? There were at least seven drills going on the morning of 9/11. Believing Muslims who couldn’t fly small planes flew big planes into buildings justifies invading Islamic countries that had nothing to do with this colossal crime, at least in the minds of a mostly oblivious American public. Just like the corrupt cops who turned their heads the other way, we pretend the greatest crime in American history never happened, yet still naively expect our nation to function in a healthy and honest manner. But just that opposite is true: it’s sick, dishonest and deadly to all living things. Failure to publicly disprove the lie of 9/11 has metastasized into a continuing series of vicious wars on other countries that have been based on lies. Afghanistan was invaded to protect the heroin trade, which is run by the CIA. Iraq was invaded to steal its oil. Our mainstream media conceal these facts. In both cases, the government said it was chasing terrorists. In reality, it was after poppies and oil, and acting as a ruthless guard dog against Israel’s enemies, as it is today in Syria and throughout the Middle East. But more recently the false legacy of 9/11 has morphed into another perpetual terror series, this one of domestic atrocities in the form of shooting episodes, some of which have actually been real. But others have been proven false, yet are described by the government as authentic before subsequent investigations prove they could not possibly have been what the government said they were. Call it the 9/11 principle — the tragedy, alleged or otherwise, is simply not what the government said it was. Once the government figured out it could get away with something as audacious as 9/11, it figured it could get away with anything. And it has, mostly. The real trouble is that the gullible public believes the first sensational story, and tends to disbelieve subsequent accounts that prove the government has lied. 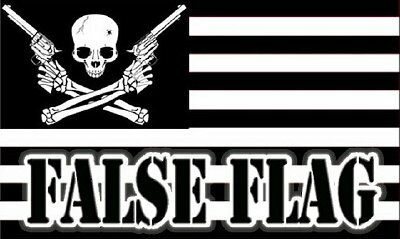 Today, “false flag” and “crisis actors” have become code phrases that trademark the crimes of the New World Order. The belief that was implanted into the minds of the world that Islamic terrorists destroyed the two tallest buildings in New York City, thereby justifying wars against Muslim nations, still dominates America’s schoolbooks and media mouthpieces and politicians the world over. It has resulted in the needless deaths of millions of people and significant destruction in Iraq, Afghanistan, Libya, Yemen and Syria. And now, in a second wave of socially significant trends, it has resulted in puzzling domestic massacres such as Sandy Hook, Boston, Aurora and now San Bernardino, in which the cops prosecute those who disagree with their disingenuous reports, and the fiendish trappings of a police state lurch into the lives of innocent people who only want to know the truth, but instead are often killed by marauding, misguided cops (trained in Israel, I might add). Though the wars have been authentically devastating, the domestic assaults have been less real, as significant alternative explanations have been put forth after serious analyses of government accounts of these shocking criminal phenomena, particularly involving the alleged crimes in Sandy Hook and in Boston. Despite all the questions and skepticism about these government accounts, a majority of Americans continues to believe the government versions of these events, particularly 9/11. So this incredulity, fueled by the faithful backing of public media that continues to verify these phony government accounts, enables the government to continue its aggression against the world and its staging of public shooting events that try in vain to whip up public sentiment against the ownership of guns. Fortunately, the American public seems totally disinclined to give up its guns, despite all these questionable passion plays the government and media produce on an almost weekly basis. The latest government lies that have received the backing of big media involve the situation in Syria, in which the U.S. government actually funds the very terrorists it claims to be fighting. Of course, most Americans don’t know this, because their public media supports the lies told by Turkey and never hears about the truth told by the Russians. This same deception of America funding the enemy it pretends has been going on with Al-Qaeda for the better part of two decades, yet a majority of Americans still don’t know it’s happening. Few Americans got to hear the real story of the American co-optation of Ukraine, either, but instead got a steady diet of government lies from the Jewish papers in New York that claimed Russia was responsible for an invasion that cost many lives, when in reality those lives were taken by American and Israeli proxies in a celebrated $5 billion invasion by the West. Failure to produce the whole truth by America’s prostituted media is rapidly leading to a situation where the only outcome will definitely be World War 3, which is what the psychos who created this whole process actually want to happen. It’s because of that chicken bone that has been stuck in our throats ever since 9/11. The compound lies it has produced will be the end of us, as we strangle on the fatal falsehoods of cynical Jewish propaganda. Take another look at the curious fact of how the FBI could pinpoint the names of all 19 “hijackers” mere hours after the traumatic event of Sept. 11, 2001, yet never uncover the organization that pulled off this complex operation in the 15 years since. This evidence of fakery manifests itself today in astounding facts like the phony blood spilled at the Boston Marathon bombing, how parents were not allowed to see their supposedly dead children at Sandy Hook, and most recently, how the alleged culprits in San Bernardino were discovered face down yet shot from the front, probably killed by local police before any of the terror events ever happened. Why did so many residents of Sandy Hook get free houses and many millions of dollars? Multiply these anomalies by hundreds among these public massacres that have all been aimed at one thing — giving up our guns — and you have a whiff of the same suspicious skepticism that arose in the minds of many after the 9/11 tragedy, the notion that our government is not telling us the truth, and hasn’t been after all the immoral wars and false flag atrocities it has perpetrated against innocent people ever since. This is the chicken bone in America’s throat that is strangling the life out of the freedom we have known, and getting rid of it wholly depends upon arriving at the truth of what actually happened on 9/11/2001. Some say that truth revealed will destroy America. That might be a healthy thing. Perhaps the most depressing aspect of this malignant condition in America today is that not a single one of the disturbing narcissists running for president today will admit to the truth of this statement, as they are all locked into the artificial reality that produces the phony wars and false flag shootings that dominate our news today. Not a good forecast for America’s future. And even populist favorite Donald Trump, who looks to be our next president, is fond of talking about the Muslims who were cheering on the western shore of the Hudson River right after the Twin Towers came down, conveniently forgetting that the thugs doing the happy dancing that fateful day were not Muslims, but Israelis.